Finally Google proves it’s prominent in smartphone market with Google Nexus 7. Google Inc. manufactured Nexus with Associate Company – Asus. To make it different and great, both are working on same model for next generation Nexus Smartphone. Google Launched Nexus 7 in 16GB and 32GB. Well we have been tried both version and recommend to buy 32GB Version. Delivering High Screen Resolution 1920 x 1200 with 323 PPI (Pixel Per Inch) which is 2 time of Apple IPad Mini. Next Generation 7inch Tablet comes loaded 4.3 Jelly Bean version. It is fast, responsive and has a great look as we expected since first look. With unboxing Google Nexus Table 7, what we get – Google Branded Nexus, A micro USB cord, AC Adapter and user helping stuff. Don’t get frustrate when you get tiny user help inside Box. 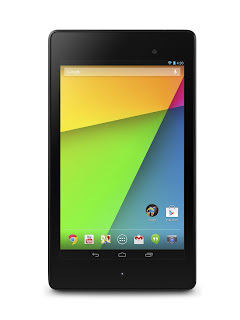 Google also helped users to use Google nexus 7 with online support and also provides PDF manual Guide for free. No need to be fear, when user get navigate to online support, you will catch up 82 page pdf file and of course, it is the best option for those who don’t want to learn by using Google nexus manual. If you’ve used Latest Google Android version, then it is quietly easy to use Nexus 7 and no need to get refer on user manual guide. Now looks back on Nexus Box, so when I got it first look while unboxing, it was unexpected as I’d. Indeed, Nexus got awesome look and has a taller face. When we come on Google Nexus 7 Screen, it is considered pleasingly and bright. Nexus screen is made of scratch resistant Glass. Closer Look with Camera: Nexus 7 has a 5MP Rear Camera, delivering killer photos but unfortunately it hasn’t Flash which is amazing fact. 1.2 MP front camera is also situated on top right which is quietly great for Skype video call, Handouts and other video conference apps. Sound Quality: nexus 7 comes with Audio including stereo speakers and virtual sounds. It would make listening music and playing videos incredible. Connectivity: Nexus 7 Connectivity option includes 2G/4G/5G, 802.11 a/b/g/n Wi-Fi, Bluetooth 4.0 and NFC. We found connectivity features execute on our expectation. Memory: Nexus 7 offers 16GB and 32GB and unfortunately, it doesn’t support SD card so you must bring 32GB version, and it would depend on users who want to install apps and games as they expected before buying it. Amazon begun to sell Google Nexus 7 2 FHD Online and available with both 16GB and 32GB versions.